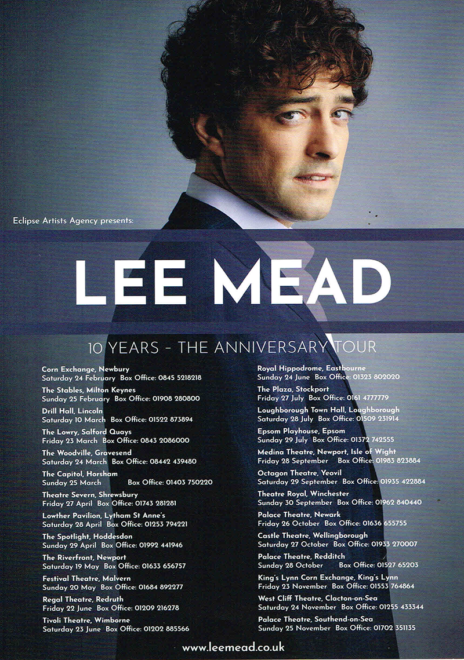 Local lad Lee Stephen Mead was born in Southend-on-Sea on 14th July 1981. He trained professionally for three years at the local Whitehall Performing Arts College, during which time he made what might have been his very first appearance on stage, as a singer/dancer in My Pal Frank, at the Palace Theatre. 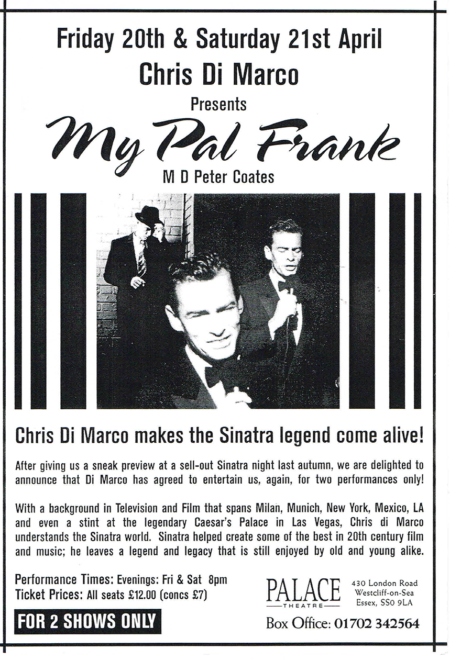 This tribute to Frank Sinatra was presented on Friday 20th and Saturday 21st April 2001 by “Chris Di Marco” – actually Palace bar manager Chris Mann, building a career as a Sinatra tribute artiste. Lee referred to this when he returned to the Palace in his own show in November 2018, musing that the last time he was on this stage he was cavorting at the back as a singer/dancer! As he established himself, his performances included the principal role of The Captain in the ballet Pineapple Poll at the Civic Theatre, Chelmsford and Wishee Washee in Aladdin at the Spa Theatre, Bridlington, where he was also lead vocalist for Summer Season ’03. He moved into musical theatre in 2004, playing both Levi and the Pharaoh in the UK touring production of Joseph and the Amazing Technicolor Dreamcoat. Lee then performed as an ensemble player in the UK tours of Tommy and Miss Saigon and the West End production of Phantom of the Opera. 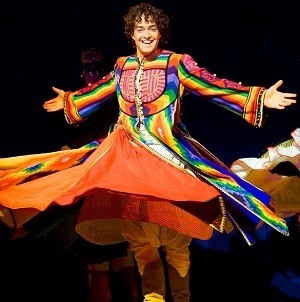 In 2007 his big break came when he won the title role in the 2007 West End revival of Joseph and the Amazing Technicolor Dreamcoat through the BBC TV casting show Any Dream Will Do. As well as subsequent West End roles in Wicked, Legally Blonde: The Musical and The West End Men, he has pursued a music career, releasing solo albums and undertaking concert tours in the UK and Japan. In 2014, he joined the cast of the BBC TV drama Casualty, playing the role of Ben ‘Lofty’ Chiltern, while continuing to tour the UK with his band between filming commitments. He returned to the stage in May 2016 as Caractacus Potts in the UK Tour of Chitty Chitty Bang Bang. 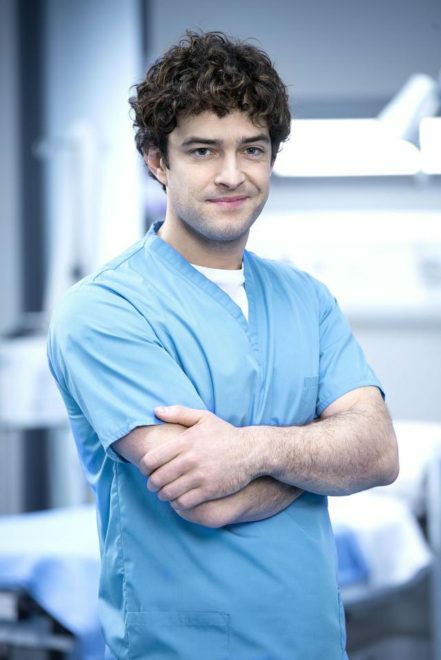 In 2017, he returned to the role of Lofty, but in Casualty’s sister series, the BBC TV drama Holby City. Over Christmas 2017 he was back in his home town, playing Jack Trot in Jack and the Beanstalk at the Cliffs Pavilion, the Palace’s ‘sister’ theatre. Back in November 2007, Lee began dating Any Dream Will Do judge Denise van Outen. The couple announced their engagement on 29th January 2009 and married in the Seychelles that April. Their daughter was born on 1st May 2010, but in July 2013 they released a joint statement stating that they had split, but remained good friends. This page was added by Jo Bund on 05/12/2018.